As a homeschool mom and blogger, I spend a lot of hours in front of my computer. My kids attend an online school, so the majority of their school work is done online. Between school work and working, I spend about 12 to 14 hours a day either on my phone or at the computer! While my job may be fairly easy as far as health concerns go, there is one major health concern that my career does affect: my eye health. 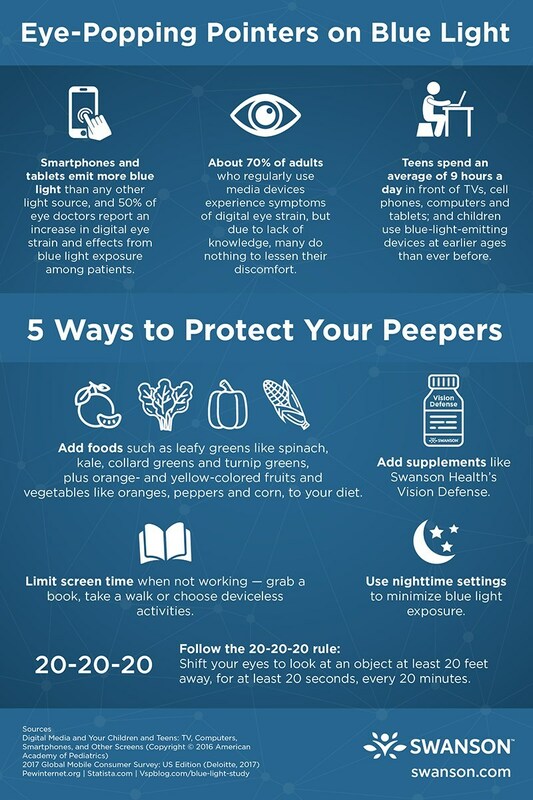 Keep reading to learn more about the steps I'm taking to support my eye health, including taking Swanson Health Vision Defense. WHAT IS BLUE LIGHT AND WHY DOES IT MATTER? All light is made up of waves of electromagnetic particles that emit energy. Shorter wavelengths have more energy. Our eyes only see visible light, which are the colors of the rainbow. Blue light has a short wavelength, which means that it emits more energy than other colors. Over time, this can cause damage to our eyes. You are exposed to blue light when you look at your computer, phone, tablet, TV, and even LED lighting. Blue light has a short wavelength, so it flickers more than longer wavelength colors. It’s thought that this flickering can cause eye fatigue, eye strain, and even headaches if you spend too much time looking at your electronic devices. After years of looking at blue light, your eyes may be more susceptible to damage, including retinal damage and macular degeneration. Personally, I’ve noticed that my eyes are getting tired throughout the day. Luckily, there are some ways to support your eye health. Eye strain can happen when there is too little or too much light in the room. Ideally, the light in the room should be half as bright as the computer screen. You may need to close the curtains or use a lower wattage bulb in your lights if you suffer from eye strain. It’s best to use lamps and not overhead lighting if you are working on a computer for extended periods of time. You might also try full spectrum bulbs, but even these can cause eye strain. Glare from a computer screen can cause eye strain and eye fatigue. If you have a lot of glare, try using a filter on your screen. If you wear glasses, opt for anti-glare lenses when you get a new pair of glasses. I recently started taking Swanson Health Vision Defense. 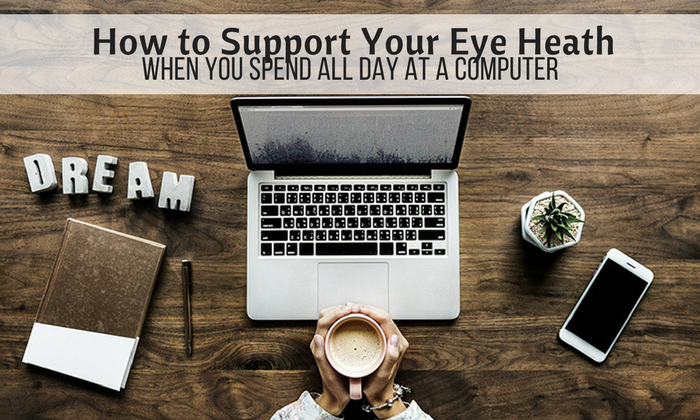 It has zeaxanthin and lutein to support eye health, which can help fight the effects of blue light from working on the computer all day. 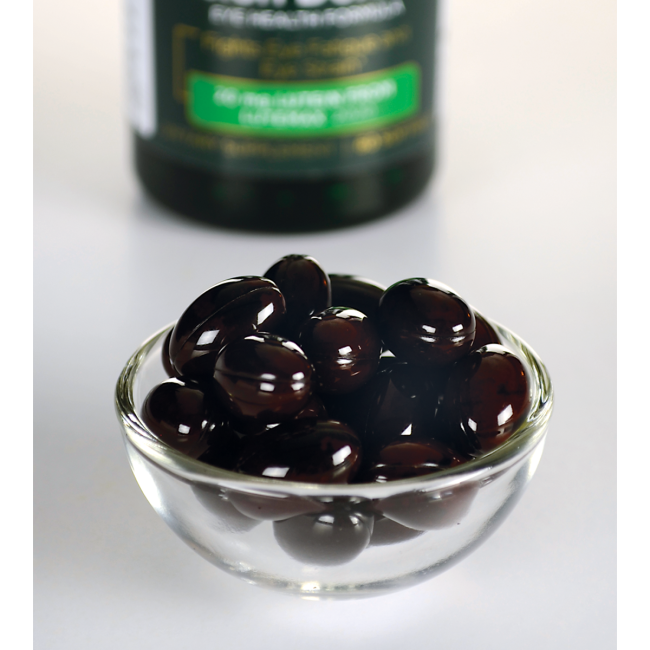 It also has antioxidants and nutrients to support healthy retinas. Swanson Health was started almost 50 years ago in North Dakota. (Side note— my daughter is named Dakota after North Dakota because it’s so gorgeous there!) They make and sell thousands of vitamins, minerals, foods, and supplements to promote health and wellness. Swanson Health Vision Defense is a new formula only available at swanson.com. Take just one soft gel every day to support your eye health. Working on a too bright or too dim monitor can affect your eyes. Ideally, it should be about the same brightness as the room in which you’re working. You can also adjust the text size and contrast for your comfort. This is especially important if you’ll be reading a long document online. Eating certain foods can help promote eye health. Click here to learn more about foods that promote eye health. When we work on computer, we tend not to blink as much, and this can lead to dry eyes. Try to blink 10 times slowly every 20 minutes while you’re working on a computer or phone. After you blink, look at something at least 20 feet away for 20 seconds. This helps relax your eyes. This is called the 20-20-20 rule, so it's easy to remember. I also try to take a break every hour to get up and move around. This gives my eyes a much needed break, and it helps me get moving during the day. 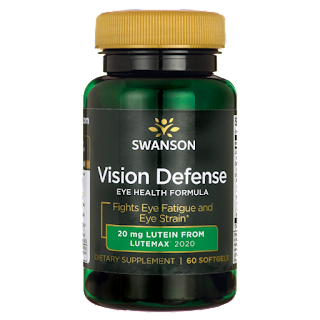 You can also enter for your chance to win a bottle of Swanson Health Vision Defense today! Swanson Health is passionate about helping people with health, no matter where they are on their wellness journey. They have a ton of amazing health & wellness information to help you combat the perils of modern wellness. Check out their A to Z Guide to Modern Wellness on their blog for more tips and tricks at swanson.com/atozwellness and join the conversation with #mymodernwellness.